I was pretty stressed out today, and didn’t get much done at work, but I think I’m getting over the shock.Â No matter how many times I get laid off, or how obviously it was coming, it’s still a tremendous life change, even if it’s a temporary one.Â It’s not as bad as it was the first (or second) time, but it is taking me some time to work through it. I think I will do one last muslin of the top after doing my final changes to the pattern, and will then move on to the skirt.Â I need to alter the waistband, add some more fullness (especially around the waist) so it drapes more gracefully, and try horsehair braid around the edges (as Kathy suggested) to give it a trifle more fullness.Â I have no idea if it will be appropriate, but I’ve never used horsehair braid before and want to see what effect it has. I am now starting to think about the design and trims for the dress.Â I had wanted to make a center panel of white and gold Alencon lace, with a similar trim on the edges of the overskirt, and sleeves made entirely of Alencon lace (because it’s so beautiful).Â But I am increasingly thinking that this would be a mistake.Â Partly because the organic lines of the lace would clash with the angular lines of the bodice, but also because I want this dress to showcase the handwoven fabric, which is beautiful in its own right.Â If I use a lot of fancy lace, people will only look at that, and I might as well use a machine-woven fabric. Mike’s mom is in town this weekend, and was kind enough to send me a gift certificate to Britex Fabrics for my birthday, so I’ll probably make a pilgrimage there with her over the weekend, and see whatÂ turns up! Sorry to read of your layoff. Several of our people are also going through a redundancy process, and it’s never a pleasant thing. 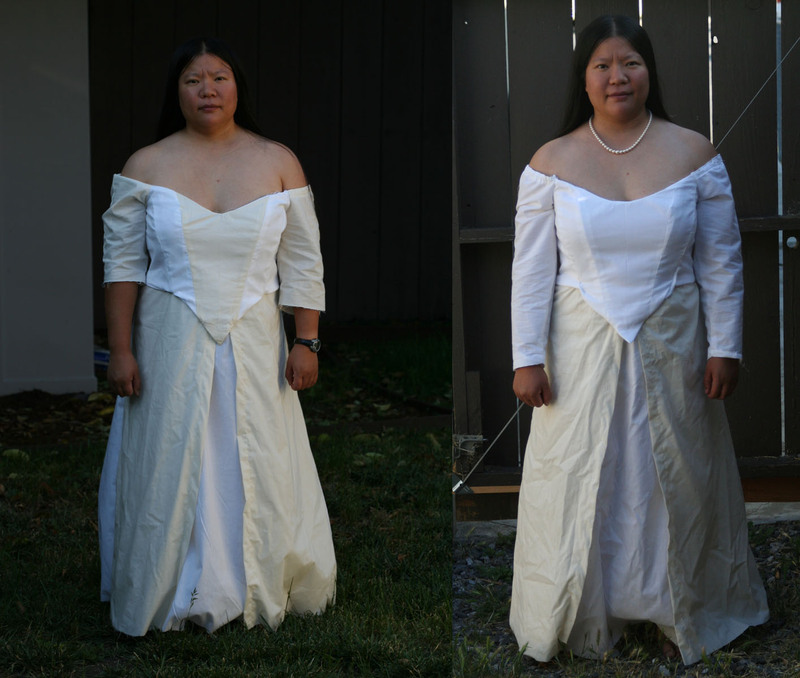 It’s really striking, the difference the alterations on the scond muslin make. I think the scooped neckline is really flattering to your shoulders as well. I’m looking forward to seeing how your work on the fabric is progressing now that you’ve woven a good bit! Tien, the fittings have made a big difference. Your muslim fittings are beginning to be more than just a work in progress and are now very complementary to your body type. The rounded neckline works so much better. I think bringing the sleeves up up a bit to just the top of the shoulder would increase the flow of the rounded lines of the neckline. The gentle curves work well in your photos. Go with the flow! You might want to gently curve the bottom of the bodice from a V shape to a more rounded curve. When you go to look for the horse hair (Britex should have it) try samples of the different widths. The size and density can make a difference in your muslim mock-ups. This is a very exciting project. What fun for you and for us readers! I agree with Kathy about the sleeve. I knew I didn’t like it as it was and she kindly explained why! Why trim at all? The focus is the dress and the coat as a unit. Lace trim of any kind would detract from the total impression. There is an old saying, trite, but it works: Less is more. #2 is a quite an improvement over #1. I like the scoop neckline much better. I think I agree with Peg about the lace. This might call for something a bit more simple. Sorry about the job situation. I, too, like the rounded neckline. I also agree with Kathy about bringing the top of the sleeves up to the shoulder line. Her suggestion to curve the bottom of the bodice is a good one. Since you will be using your beautiful handwoven fabric for the dress, I would not embellish it with lace or a contrasting trim. If I were to embellish the dress, I would couch a fine silk rope made from the yarns used in the fabric along the princess and bottom bodice seams. However, I would complete the dress and coat before doing any embellishing. The sheen of the silk with the subtle woven design will sparkle as will the bride!